You have constantly heard about the importance of olive oil to your health and why it needs to be in almost every kitchen cabinet. Whether you heard it from your teacher, colleague, or any other source, the fact remains that this oil is healthy. According to various studies, olive oil has the ability to prevent many diseases, including diabetes. There are also beauty benefits attached to it- the oil acts as a hair moisturiser and skin protector. After all, it is rich in vitamin E, antioxidants, and omega-3 fatty acids. However, you may not be aware that olive oil exists in different types. 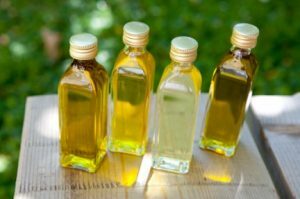 Completely unrefined (extracted without the use of heat or chemicals), extra virgin oil contains the highest quality of all the olive oils, and this explains why it is the most expensive. In comparison to other types, this oil boasts the lowest levels of oleic acid and the highest amount of vitamins and minerals. Associated with a distinct flavour, no one ever wants to miss this golden-green coloured oil in their kitchen. This is probably the next big thing after extra virgin oil, and it is also unrefined. Virgin olive oil has a slightly higher level of oleic acid than extra virgin oil- this is what makes them different. This oil is useful for cooking, baking, and vegetable sautéing. This is one of the cheapest olive oils, and it contains fewer vitamins and other nutrients than virgin and extra virgin olive oils. It is also inferior to the two oils in terms of flavour and taste. Refined olive oil contains no antioxidants or anti-inflammatory properties. However, it is still good for culinary purposes. This is a combination of refined and extra virgin olive oils. Its nutritional value is lower than that of virgin olive oil. When heated, it produces a distinct odour, which makes it less preferred for cooking.